Did you know modern statistics state that you have 60 seconds or less to capture your audience’s attention? You’ve might have heard it before, but maybe not in terms of presentations. It’s crucial to understand the importance of grasping an audience’s attention in the first moments of a talk. Your opening lines set the tone for your overall performance, so a great opener will prepare and intrigue the audience and ensure that your message is effectively received. So, how do you enchant an audience right off the bat? Here are 5 methods that we have found work the best for beginning a presentation. Stories are always memorable. We crave stories because we all have them. 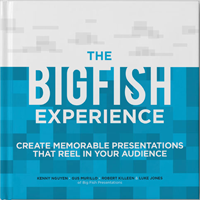 Proposing this shared experience with your audience allows them to identify with you on a personal level. Now that you’ve established a connection with your listeners and viewers, you can merge your message with their thoughts while keeping them engaged and entertained. Just remember to keep the story relevant to the requested topic/event you were asked to speak about in order to maximize effectiveness. A question is an excellent tool for jump-starting audience engagement. A simple “How’s everyone doing?” opens up a forum of sorts for the audience, empowering them and making them more receptive to your message. A question also makes the audience think for themselves about a topic that you control. This is a great way to set and reinforce the agenda of your choice while giving the audience a sense of power. Referencing the words and thoughts of an expert in relation to your message is useful for establishing an overarching theme or general idea about the topic. You are imparting wisdom on your audience while creating a segway into your own topic. Since you have primed the audience with a nugget of value, your information now appears to be equally as valuable. Just make sure you follow up the quote with an explanation of how it empowers your topic and how it is relevant. Normally, numbers or any type of data can seem boring in a presentation. However, when used correctly, statistics can be very effective in illuminating your topic. The key is to use very clear, accurate and relevant information in order to truly engage your audience. A solid statistic places your incoming message in a concrete, irrefutable and trusted frame of reference. Data not only provides your presentation with a trusted source, but also lends credibility to everything you say thereafter. Humor is extremely powerful and is often used effectively. A good joke can loosen up your audience and make them more receptive to you as a person as well as to your message. Be warned, though, that humor is highly volatile. A bad joke can be worse than no joke at all. Make sure you have a scope for your target audience before you dive into a dud of a joke. Well, there you have it. Use these techniques in your next presentation to prepare, engage, control and entertain your audience. Like all things, these methods are only suggestions and their effectiveness depends heavily on delivery. Make them your own, and you will appear more natural and fluid in your performance. What do you think? Are these useful? Leave us a comment below or on Facebook and/or tweet us your thoughts! We are huge fans of feedback! If you haven’t already, subscribe to our blog and our YouTube channel on the righthand side for more intern videos and behind-the-scenes looks of the Big Fish team! Update: Check out a visualized version of this blogpost below! An interesting read. No doubt the information would be useful to a complete neophyte but it’s pretty old hat for anyone who had been around public speaking or even a public speaking club like Toastmasters for any length of time. This is information that all the students that I mentor has down pat by the time they give their “Ice Breaker” speech. The students have an awesome teacher then! Building that foundation is so important. Kinda harsh Jerry. We both know that hundreds of presentations are given in Baton Rouge each day, and by company executives, where few if any of these five key pts. are applied. And the audiences suffer the consequences of the speaker’s lack of skill and preparedness. When you add in the folks who are new to giving presentations I think this article was really helpful. You’re right that groups like Toast Masters are an excellent way to learn public speaking. Just wish you weren’t so negative with your comment. It struck me as condescending and I’m hoping you didn’t mean it that way. I agree the connection with the audience is crucial. I recommend my clients, when they use a question to use slightly different language than what was suggested above to enhance the connection with the audience. Rather that asking “How’s everyone doing?” I get them to ask “how are you doing?” . A simple one word changes personalises the question for every single member of the audience – build a connection with my clients as they speak. Thanks for this post – it’s a handy summary of some good ways to open a talk.